Bill Gates, over the years, has had quite a complicated relationship with Apple. But the man who spent years going toe-to-toe with Steve Jobs in some of the most contentious battles in the history of American business now has effusive praise for his longtime rival. "It's an amazing company," Gates said on CNBC Monday, in an interview at the Berkshire Hathaway shareholder meeting. "The multiple's not gigantic, it's not like a tech-speculative company that's still losing money or anything." "The top tech companies do have a very strong profit position right now," Gates added. "But Apple has the strongest position of all." The comments were a reference to Warren Buffett's recent investment in Apple; during the interview, Gates was seated next to Buffett and Berkshire's vice chairman, Charlie Munger. Gates, who left Microsoft in 2014 and devotes most of his energies to his foundation, is a Berkshire Hathaway board member. Buffett, in the same interview, added that the reason for the investment was more about how consumers react to it than any kind of commentary on the quality of the products. In fact, Buffett admitted in the interview that he didn't own an iPhone until someone sent him an iPhone X recently. "It's the consumer behavior with the product, what they do with it, how it becomes part of their lives, that I observe and primarily reason from," Buffett said. "It has a position in customer's minds, and a utility to them, that's very, very useful, and it's an incredible ecosystem that they've found ways to profit from as they've gone along." Apple is an 'amazing' company, says Bill Gates from CNBC. The cofounder of Microsoft, during his years in charge of that company, frequently squared off against Apple. They fought for market share, they fought in court, and they battled over larger questions of what the direction that computers would take. Apple accused Microsoft of ripping off the Macintosh with Windows, while there was even a long-running copyright infringement lawsuit claiming that Microsoft had stolen ideas for graphic user interface elements. But things weren't always contentious between the two companies. In 1997, shortly after Jobs' return to Apple, he announced a controversial deal in which Microsoft invested $150 million in Apple, agreed to support Office for Mac, make Microsoft Explorer the default browser on Macs, and settle that lawsuit. 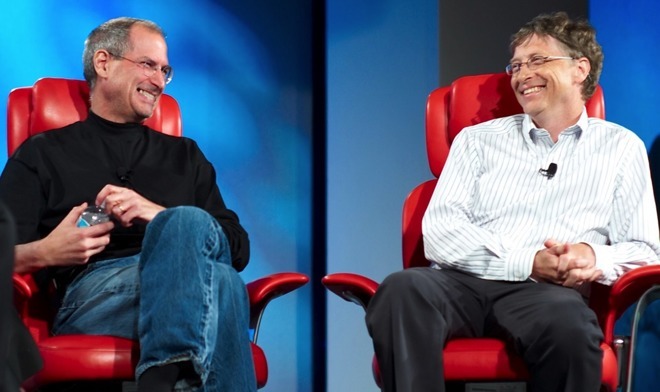 In their later years, especially after Gates stepped down as CEO in 2000, he and Jobs would occasionally appear together at conferences and for on-stage interviews, such as at the 2007 D conference. 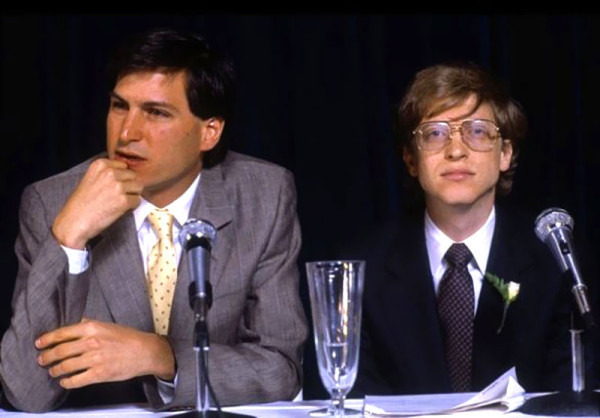 The Gates/Jobs relationship was the subject of the 1999 TV movie "The Pirates of Silicon Valley"; a Broadway musical about the two of them, "Nerds," was planned in 2016 but cancelled before it was produced.